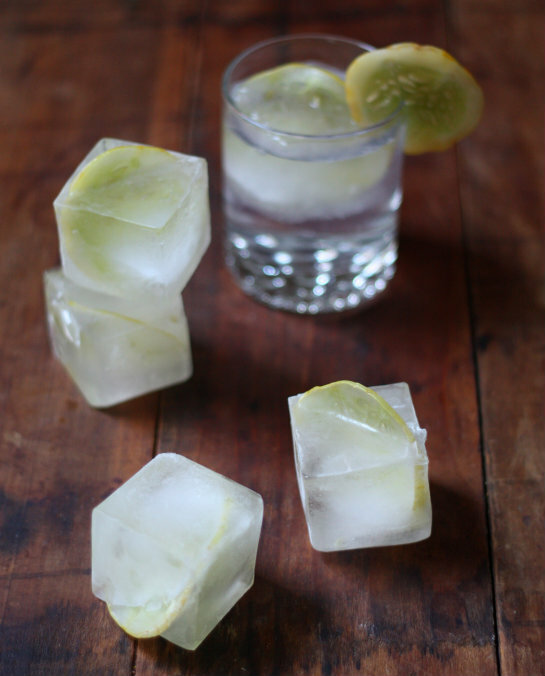 Yes, this is one of those summer recipes that's been in the queue for a while and before summer escapes us we wanted to share another fun ice cube idea. Who are we kidding — this is a cocktail post! 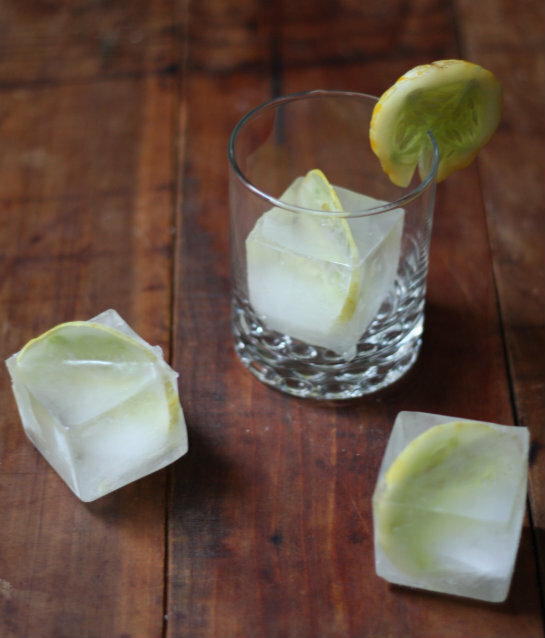 We just happen to throw a fun ice cube into the classic gin and tonic. I originally shared these cubes in a guest series all about ways to dress up an ice cube over on Lot18 so today we'll share what we made behind the scenes to spice these guys up — just in time for the long weekend. 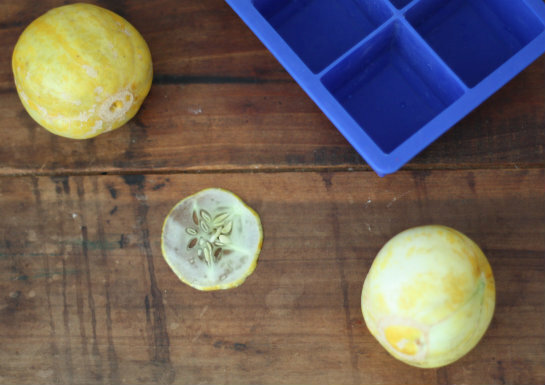 Lemon cucumbers are not a new thing, farmers have been cultivating these for years. It looks like a lemon but when sliced you get the burst of that fresh cucumber aroma. As far as taste is concerned, you guessed it — tastes just like a cucumber, although it is a little sweeter than your standard long green commercial cucumber. 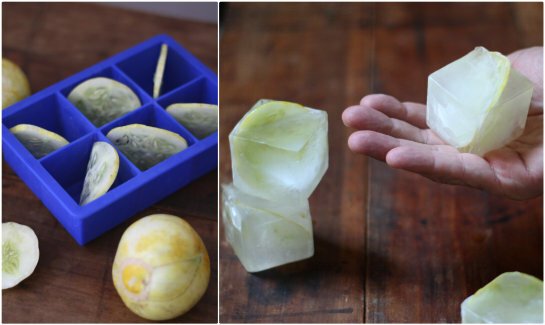 To make lemon cucumber ice cubes, thinly slice the cucumber to expose seeds, arranging 1 slice diagonally across each ice mold. We like to use this silicone mold for extra large ice cubes. It not only looks cool and old fashioned to have a single large cube in the cocktail, but the larger cubes melt slower and the mold is dishwasher safe. Start by pouring a shot glass serving of gin into the glass (if more slips in we won't tell) and finish off with bubbling tonic. We keep our gin in the freezer to keep it cold and prevent it from melting the cube once poured. 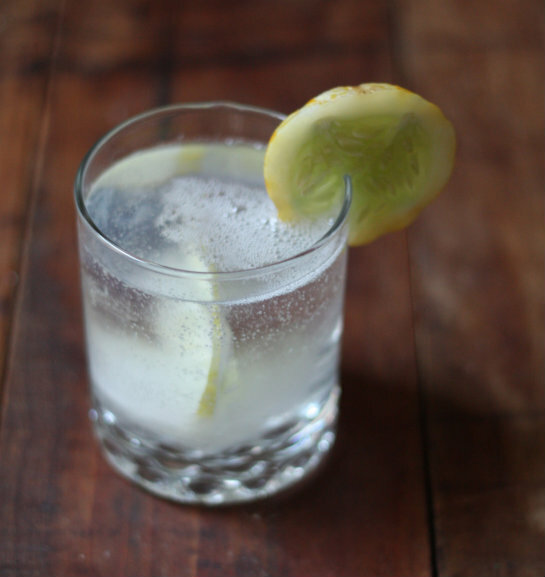 When tossing a sip back, the fresh smell of cucumber hits the nose which adds to the cleanliness of this drink. With Labor Day weekend upon us we really just do not want to let go of the fresh tastes and drinks of summer. If you cannot find a lemon cucumber in the markets then a regular green cucumber sliced thinly will do the trick. 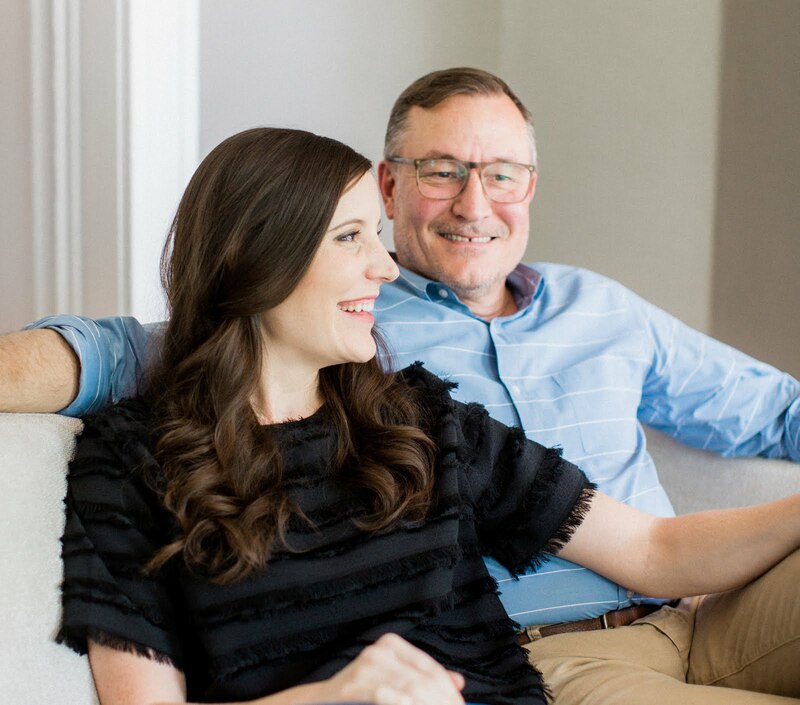 We hope all of you enjoying this holiday have a fabulous and safe weekend! 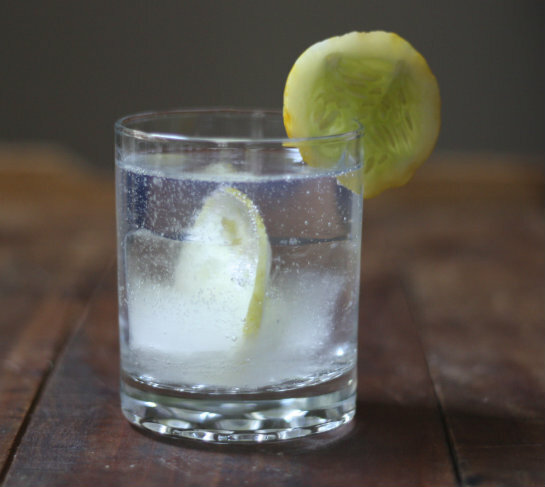 I love the idea of adding cucumber to gin tonic! Haven't seen lemon cucumbers on the market here but I'll try with a regular green one. Ooh! I gotta try this. Ah so refreshing! and I read somewhere that gin is actually very healthy for you! say no more, chin chin! 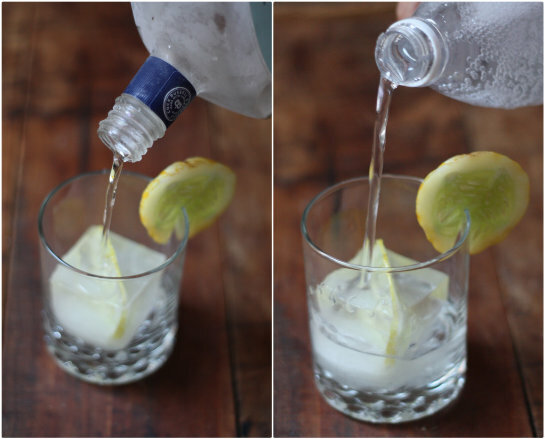 I did this recently with limes in ice cubes for my Grey Goose vodka. I love gin though too! Thanks for the recipe!